87-year-old Mississauga mayor Hazel McCallion gets her energy from drinking raw milk — rumour or fact? Does she or doesn't she? 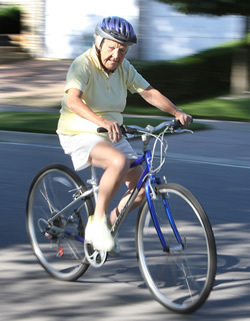 87-yr old Mississauga mayor cycling near her home in Streetsville, Sept 2008. National Post photo by Peter J. Thompson. Last weekend I overheard someone talking about how the famously energetic 87 year old mayor of Mississauga, Hazel McCallion gets her get up and go from drinking raw milk as part of her diet. However I can’t find any stories on the web that support this assertion. Does anyone out there have more information on this? It would make a great story. If you know more, please comment on this post or email thebovine at gmx dot com. Thanks. See the National Post story that the photo is from.